I've always love Batangas for its cool weather and delicious kapeng barako. My in-laws live in Lipa City so we would visit them once in a while. However, I never got a chance to explore the city. I have plans of going around Lipa and nearby towns and been wanting to do a sort of cafe hopping to find the best tasting kapeng barako in Batangas. 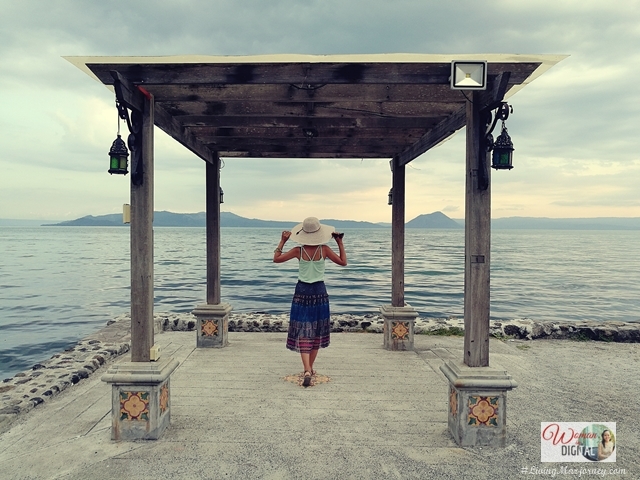 My trip to Club Balai Isabel in Talisay was more than just a cup of kapeng Barako. I thought I would not make it on time. It was Friday, booking a Grab and Uber was quite challenging and the traffic was really bad. I was late and sharing a ride made it even more impossible to arrive on time. I gave up, apologized to the group and told that I cannot make it anymore. What happened next was unbelievable? My shared Uber passenger suddenly go down. Maybe, it was meant to be that I would be spending one weekend in Talisay. It only took us two hours going Talisay. 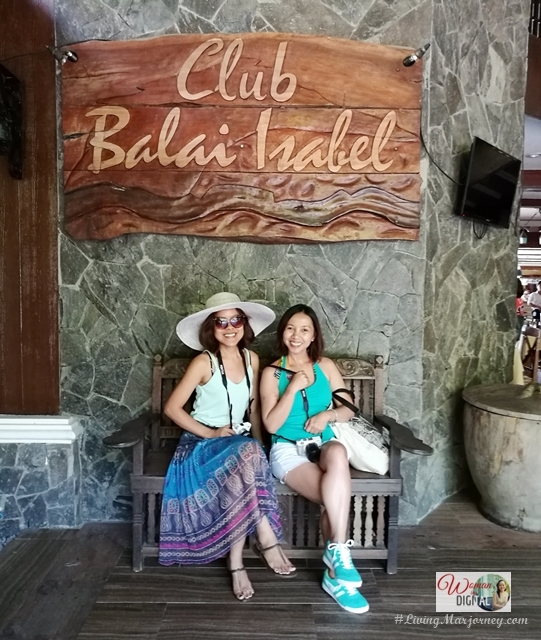 We arrived in Club Balai just in time for lunch at Terraza Restaurant. I don't mind dining in an open-air facility if there's a magnificent view such as the Taal lake and volcano or a perfect landscape of infinity pool. The buffet spread composed mostly of famous Filipino food and desserts. But the star of the buffet was fried tawilis, a freshwater fish that can only be found in the Philippines, at Taal Lake to be more specific. There were afritada and pork binagoongan as well. Dessert composed of palitaw and sliced fruits. I forgot about kapeng barako and tsokolate Ah because I was mind planning of the things I would like to do. We stayed in a villa with attic at Laurel Lakefront Suite. 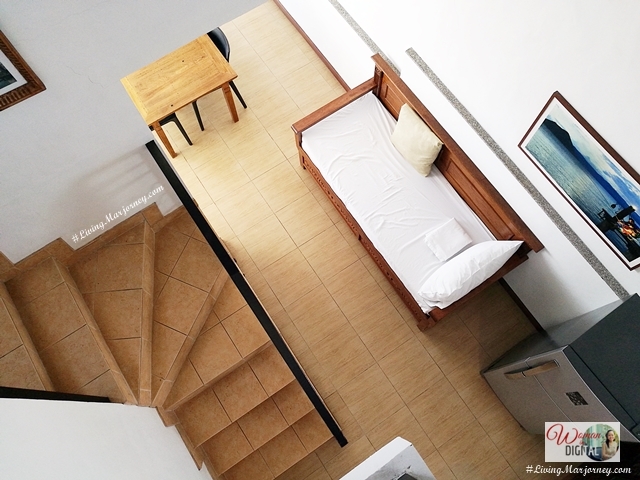 There were two bedrooms which can accommodate three people in each rooms. 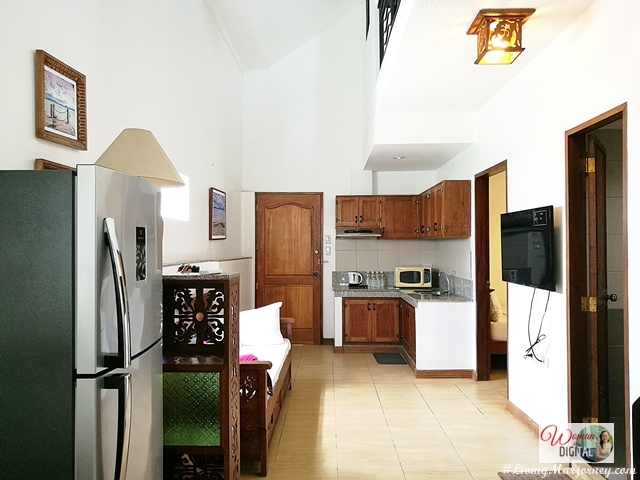 The living room has two (2) day beds, an LCD television with cable, refrigerator, kettle, microwave oven, dining table and kitchen. From the veranda, during the day we have the view of Taal lake and volcano; at night the moon and stars. The boys occupied the second floor. My friend Aylin and I shared the queen-sized bed. Paul occupied the extra bed. Joy and her family stayed right next to our room. The attic can accommodate six person. There's a bathroom as well. Here's a view from veranda. We waited for the sun to go down and toured around Club Balai. Amidst the modern accommodation and facilities, Club Balai Isabel remains true to its mission of preserving the natural beauty of the land. The resort is surrounded with lush greens, variety of trees and flower plants. With over 20 function halls, 5 restaurants, gift shops and cafeteria, 3 large swimming pools, hotels and condotels that suits every guests need and budget. 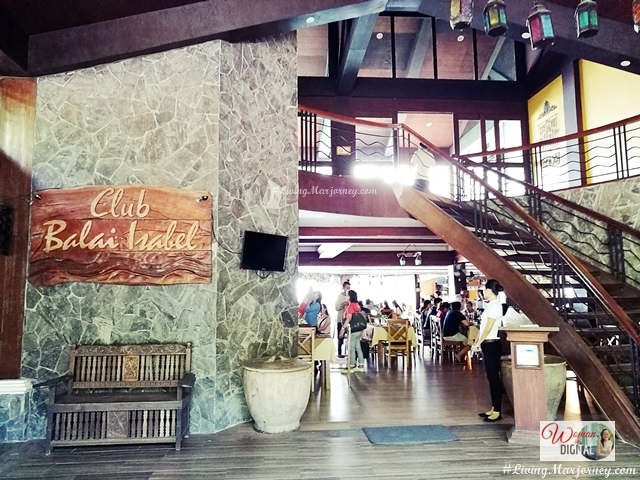 Day trip would not be enough to experience the entire Club Balai Isabel. I highly recommend getting a room and staying at least one day. Balai Isabel offers variety of water and outdoor activities. From banana boat to kayaking. If you're willing to spend extra, you may want to rent a speed boat or jetski. Taal Trekking is also one of the activities being offering at Club Balai. Rates starts at Php 3,500 which includes a boat ride, tour guide, bottle water and buri hats. At Taal, guest can do horseback riding as well. 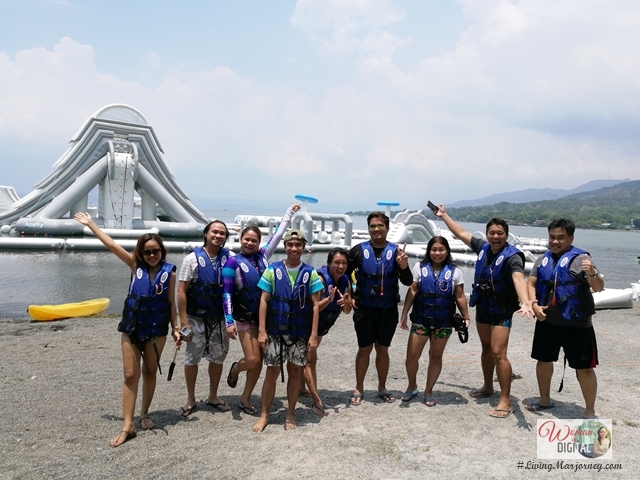 Apart from the usual water sports and Taal trekking, Club Balai Isabel opens the biggest floating playground in the Philippines - the Aqua Park. I am one of the few guests who were invited to personally experience the floating playground before it opens to the public on April 29. I do not know how to swim and I'm afraid of the water but I always love going to the beach or lounging by the pool. On the other hand, my husband is opposite of me. He would jump, dive and play in the water. A swimming pool has been a requirement for us when booking a hotel. I was afraid to try the Aqua Park but with these amazing people around, I tried it. It was fun and exciting even just walking and running on inflatable floats and trampoline. The adventurous tried the giant slide, some of us were just contented in small activities. Over all, our group enjoyed the Aqua Park under the extreme heat of the sun, at 12 noon to be exact. Photos were taken using the Cherry Mobile Action Camera. Aylin and I have been friends for almost 7 years. She was part of my wedding entourage. Oh hello Paul! Enjoying the giant floating tube. Thanks Jinkee for this shot! Package 1: Php 1,850 per head that includes morning and afternoon snacks, lunch, entrance and use of facilities and one hour access to Aqua Park. Package 2 for only Php 990 per head and includes entrance and use of facilities. Without meals but you can still dine at the restaurant and pay for the food. Includes one hour access to Aqua Park. 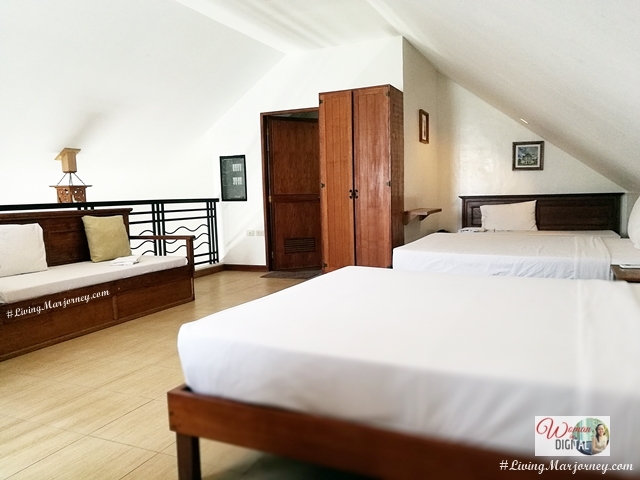 Package 3 is Php1,600 per head and includes morning and afternoon snacks and lunch. Entrance and use of facilities. The Aqua Park in Batangas will stay in Club Balai Isabel so there's no need to pack your bags and hurry. Better yet start planning your summer adventure in Club Balai and make sure to reserve a room for the whole family. Always wear a life vest. Refrain from using the aqua park if you have any injuries even minor injuries. Wear aqua shoes or nothing. I removed my slipper and it feels more comfortable walking on the floating island. It's better to have someone with you, like a buddy system. Kids should be with parents. Don't forget to bring waterproof camera or underwater camera to document your experience. Bring bottled water, you'll sure to get thirsty after the activities. From Manila take SLEX and head to Tanauan Exit going Talisay Batangas. It's near Talisay city hall. WATCH how I fell after posing for a photo, lol! I can say that it’s luxurious living within reach. You can hit off to this weekend getaway with your loved ones setting a specific budget or splurge a little. Alternatively, you can drop everything at work, re-connect with nature and find peace and quiet in your “alone time,” to recharge your spirit. I promise to be back at Club Balai Isabel, next time with the love of my life. Lovely post! :) Tagal na nating mag-Bff. :) See you soon. Love you! Ohh ang ganda ng place. Sana one day makatuntong din aking mga paa dyan.